Endangered species protections were removed from the Yellowstone grizzly bear population in April 2007. The Natural Resources Defense Council (NRDC) and other conservation organizations immediately filed a lawsuit in federal district court in Idaho challenging this decision. NRDC and others argue that: (1) grizzlies are still threatened by development and loss of key natural foods such as whitebark pine; and, (2) regulatory mechanisms, including state and federal plans, are inadequate to maintain the population. The briefing in this case begins in August 2008; it will likely take several years to resolve. Meanwhile, about 30 bears have been killed in the Greater Yellowstone by humans, as of July 2008. Most grizzly bears do not die of natural causes: humans kill them. In the summer of 2007, the allowable human-caused mortality level was nearly breached for female grizzly bears, which are especially important to the survival of the population. (If one more female had been killed, the allowable thresholds would have been violated). 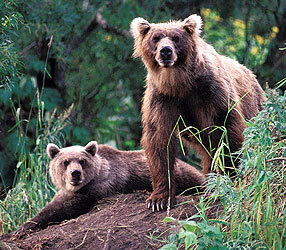 A record number of human maulings by grizzlies also occurred, many during the fall 2007 big game hunting season. A number of the hunters were not carrying bear pepper spray, a known effective deterrent in grizzly conflict situations. Since the film was completed, the prognosis for whitebark pine has significantly worsened. New models by Forest Service experts predict that whitebark pine may become functionally extinct in the Greater Yellowstone Ecosystem in the next seven to ten years. Since about 2001, whitebark pine has been suffering unprecedented attacks by mountain pine beetle, which have been able to survive in these high-elevation forests because of warming temperatures. Also, the infection rates of a non-native pathogen, white pine blister rust, have also been increasing in whitebark pine; blister rust is as lethal to whitebark pine as the chestnut blight is to the chestnut tree. Attention is turning increasingly toward restoration of whitebark pine using cones selected from trees determined to be genetically resistant to the rust. But since whitebark pine trees do not produce cones until they are at least 50 years old, such efforts will not likely help the grizzly bear in the near term future. There is no known substitute food of similar quality for grizzly bears in the later summer and fall, when bears need to fatten up for winter. If whitebark pine declines as predicted, grizzly female reproductive success will drop, and human-caused mortality rates will increase as bears are forced to forage in lower elevation habitat to search for food. Here in these lower areas, human development and subdivision is escalating. Some counties around Yellowstone Park are doubling in population every six to seven years. Instead of living in towns, many new arrivals seek to build homes in river bottoms and near national forest lands — the best bear habitat. The pattern and nature of these developments will make it even more difficult for grizzly bears to access alternative foods as whitebark pine declines. In addition, threats from energy development are increasing in and around key habitats that grizzly bears will need to use to offset the anticipated loss of whitebark pine in the core of the Greater Yellowstone Ecosystem. Of particular concern is natural gas development in Wyoming’s upper Green River area. Also, new high-voltage energy transmission lines are being proposed that would, if built, potentially sever Yellowstone’s grizzlies from other grizzly populations to the west and north — leaving Yellowstone grizzlies isolated forever. This development would exacerbate the existing problems related to the loss of genetic health of Yellowstone grizzly bears following 100 years of isolation. In the delisting rule, the federal government acknowledged the genetic problems facing the Yellowstone grizzly, and proposed to import one to two bears every ten years to add to the grizzly gene pool. Citing numerous scientific studies, conservation organizations argue that the genetic health of Yellowstone’s grizzlies could be maintained naturally by connecting Yellowstone grizzlies through natural corridors. Reliance on ongoing, expensive, artificial importation of grizzly bears does not constitute long-term recovery. The population must be naturally self-sustaining to be recovered. Lasting recovery of Yellowstone grizzlies is within our reach, but only if we: (1) act in ways that don’t promote unnecessary conflicts or grizzly bear deaths; (2) plan ahead to accommodate the anticipated loss of key grizzly bear foods from global warming and disease, including whitebark pine, army cutworm moths, and cutthroat trout; and (3) work to prevent unnecessary fragmentation and loss of key habitat, and to ensure that ecological connections between Yellowstone and other grizzly populations are protected. Grizzlies in and around our nation’s oldest park deserve our best efforts to ensure that they will be here for the enjoyment of future generations. In light of shrinking habitat and new threats from global warming, grizzly protections should be redoubled — not removed.